Rose has always been the symbol of love and beauty since ancient times.Cleopatra, the ancient Egypt queen used rose petals in her face mask and bath to enhance her beauty.Today, rose extract is widely used in the preparation of cosmetics, perfumes, and face masks.Rose contains numerous health and skin care benefits.It helps in the treatment of scars, pimples, dark spots, skin ageing and maintains skin firmness, promotes elasticity and imparts a rosy skin glow.Find out these amazing rose face packs for irresistibly smooth, fair and radiant skin. 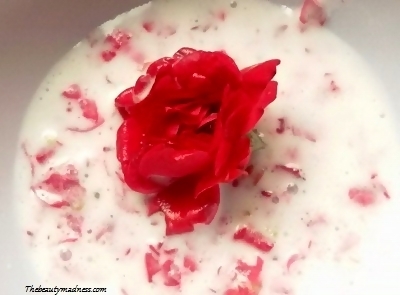 To make this amazing rose face pack you need few rose petals and thick yogurt.Make sure the rose petals you use must be fresh and properly washed.Add few rose petals and 3 tbsp of yogurt into the blender.Blend it to form a semi-smooth paste.Apply this face pack on your face and neck.Leave the pack for about 20 minutes and then wash it off using cold water. One of the best rose face pack to lighten your skin tone naturally.Yogurt contains lactic acid and enzymes that lighten areas of hyperpigmented skin and delays skin aging.Rose contains high amount of vitamin C, an antioxidant that protects sun damage and brightens skin tone.This pack is best for all types of skin.Use this face pack thrice a week for effective results. Pour the contents of an egg white into a bowl, add 1 tsp of honey and few crushed rose petals.Mix it and apply on your face and neck with the help of a flat brush.Allow the pack to dry completely.Wash your face with cold water. 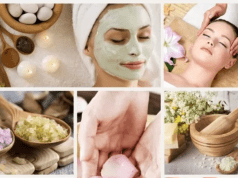 Rose petals contains astringent and soothing properties that tightens skin pores, reduce skin redness and gives your skin a rosy complexion.Egg white lift facial skin, reduces wrinkles and makes your skin firm and smooth.Honey contains antioxidants that boost skin elasticity and revive skin youthfulness. 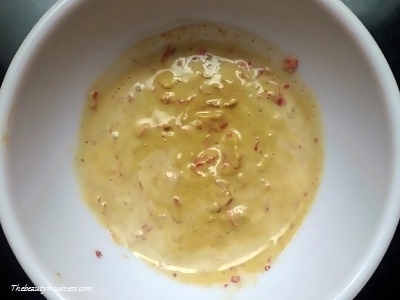 To prepare this face pack you need 2 tbsp of sandalwood powder or paste, 1/4 cup milk and some rose petals.Place all the ingredients in a blender and blend it to form a smooth consistency.Apply this pack on your face and leave it to dry for about 15 minutes.Wash your face with cold water. This is a very good face pack to lighten blemishes and acne scars.Sandalwood has antibacterial properties that prevents pimples and removes excess oil, dirt and dust from your pores.It also reduces skin tan and makes your skin clear and radiant.Milk removes pigmentation and other skin blemishes to give your skin smooth and flawless complexion.Rose has antiseptic properties that kills bacteria trapped inside pores and soothes irritated skin. 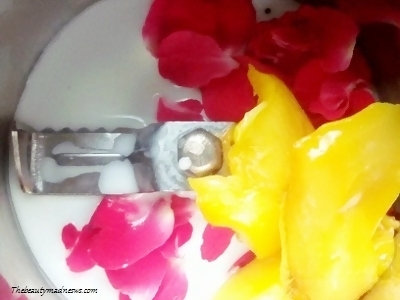 Cut 1 small sized ripe mango and scoop out the pulp.Add this mango pulp and few petals of roses into the blender.If you have dry skin add 4 to 5 tbsp of milk and oily skin can use rose water.Blend it until it forms a smooth paste.Apply this pack on your face and leave it to dry for about 15 minutes.Wash your face with cool water and pat dry. This is one of the rejuvenating and hydrating face packs for both dry and oily skin.Mango is rich in vitamin C and vitamin E that boost collagen production and moisturizes your skin to give your skin a healthy, radiant glow.Rose are excellent source of vitamin A, B3, C and E that keeps your skin silky and soft, brightens your complexion and gives your skin a rehydrating boost. 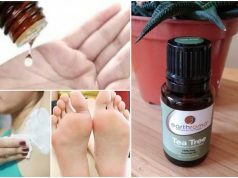 To prepare this pack, you need 2 tbsp of dried orange peel powder, few crushed rose petals and 2 tbsp honey.Combine these ingredients properly.Now take small amount of the paste on your palms and rub it on your face and neck gently.Apply some more and leave it to dry for about 20 minutes.Wash your face with lukewarm water and apply some moisturizer. A wonderful exfoliating face pack for oily skin.Orange peel removes dust and pollutants from pores and removes sun tan.Honey deep conditions your skin, fades dark spots and other skin blemishes.Rose help retain skin moisture, deep cleanses and clarifies the skin thus revealing a smooth and vibrant glow.